We are significantly underestimating the benefits of climate-smart growth. A new report released by the Global Commission on the Economy and Climate finds that bold climate action could deliver at least US$26 trillion in economic benefits through to 2030. "We're at a decisive moment. The decisions we make today are crucial because it is urgent to stop climate change and because we have a unique window of major structural changes in the next few years. 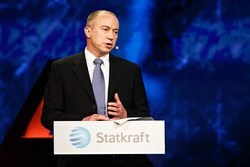 Setting a price on carbon emissions is the most important single measure we can do," says Christian Rynning-Tønnesen, CEO of Statkraft. Rynning-Tønnesen is a commissioner of The Global Commission on the Economy and Climate, an initiative that works to provide evidence on how countries can achieve economic growth while dealing with the risks posed by climate change. Since 2014, the group has released several reports that support investments in renewable energy and low carbon solutions to create opportunities for growth, new jobs and economic development. Over the past few decades, the world has seen tremendous technological and market growth in parallel with a shift to a greener economy. The report describes an increasing momentum worldwide to focus on sustainable and climate-friendly solutions. Still, the shift does not come soon enough. The report "Unlocking the Inclusive Growth Story of the 21st Century: Accelerating Climate Action in urgent times" was presented at the Global Climate Action Summit in San Francisco in September.